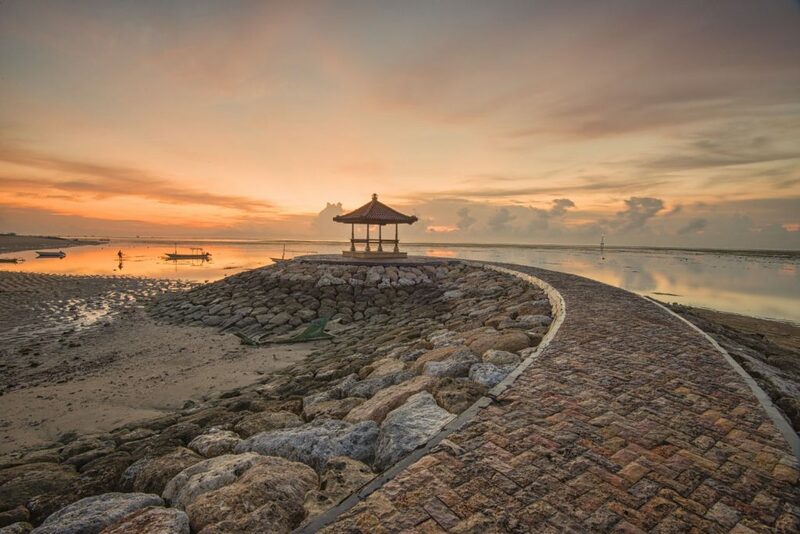 Merta Sari Beach, or Dream Island is located in Sanur Bali area towards the Mangroove Forest. This place is famous from the first, many foreign tourists visit this beach. Local residents also often use this place to spend their weekend with family. Even this place becomes an interesting spot to fly a kite. If we just want to just hang out, here is a suitable place. In addition there are also crowded traders. Similarly, the sunrise beaches of Sanur Bali, so you do not need to be confused to find snacks, even in this area is also the most famous spot for photo couples & prewednya. Many photographers and couples immortalize their memories with others, some looking for bridge view, dried trees with many branches, rows of trees on the beach, it's all the most interesting spot here when late afternoon, and the sea water starts to recede. The location is very easy to reach, you can not get lost, when I first came here already feel very wowh. Now on this beach has changed somewhat, for the area that passes the bamboo bridge which is now a wooden bridge and has a new name that is' Dream Island, entrance ticket 20ribu / person can already welcome a glass of drink and snack, the favorite spot here is swing. 0 Response to "Mertasari Beach Bali (It is suitable for prewedding)"